Procraftination: Happy Birthday Anne Marie!!! 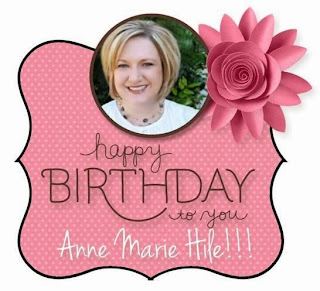 It's a surprise Happy Birthday Link Up for Anne Marie Hile! My 6 month term as a design team member at the Dynamic Duos challenge blog ended recently. Anne Marie is the DT and blog coordinator...and all around "go to" person for any questions or "help!". She's a sweetheart! So, I couldn't miss the opportunity to participate in this link-up and wish her a very Happy Birthday! I know that your pets and foster-pets adore you and flourish under your care. So, I just had to pull out some Lawn Fawn critters for your birthday card. I used my Prismacolor pencils to color these two pets. The puppy is sporting a little bling on her collar - pink Stickles and a pink gem. I added a little polka dot valance to my window (thanks to my seldom-used paper crimper). The sentiment is stamped on vellum...so as not to obstruct the view from the window. Ha! Yes, this pair agrees that Girly...you rock! So sweet, love those little dog and cats, this is just the sweetest thing ever!!!! Adorable card Susie, lovely colouring. This is so CUTE!! Love the sentiment too. Anne Maire will treasure this! I just love the little curtain for the window and the sentiment on the vellum, adorable! This card is simply perfect for AM!!!! Love it so much, Susie. A Big THANK YOU to Cath!